Business cards are a low-tech tool that still has excellent use in this digital world. They never need to be charged and the work without a great Wi-Fi connection. Here are the four main benefits of business cards for your brand. Business cards are a low-tech tool that still has excellent use in this digital world. Business cards are quick and easy to use, especially in the midst of a conversation. Whether you’re attending a networking event or happen to mention your career in a social conversation, it’s a quick way to reference your experience, business, and contact information. When you keep them on hand in your wallet or purse, it’s a sample as pulling one out, and you have all the necessary information available to make the connection. Business cards are efficient and professional. Speaking of professional, business cards help give your brand legitimacy. This point is especially true for small business owners. Having a business card that has a design that reflects the images, logos, and colors of your brand will take your professionalism a step further. It gives potential clients and customers the peace of mind in knowing that they are dealing with a company that has credibility and expertise. 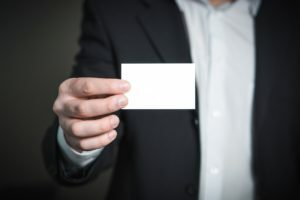 There’s a reason why business cards are the quintessential networking tool — because they are practical, simple, and easy to duplicate. When people order business cards, they often order them by the hundreds. When you’re attending a showcase, meeting, or networking event, you’ll have all the tools you’ll need to sell your services, business, or products right in your pocket. The business card transcends trends and is always appropriate in any setting. As a professional, you’re not always going to be at work, but there are still opportunities to promote your brand and what you can offer. With that said, business cards make sure that you are always prepared to make the connection. If a casual conversation turns to business, you’ll be ready to offer more information with your business card as they usually include website information and your contact details. This entry was posted on Friday, August 10th, 2018 at 3:19 pm. Both comments and pings are currently closed.